Similar Themes, Episode 1: Mexico. Young Ladies. Rockers. I present to you two songs with at least a couple things in common. Perhaps they both come from a long line of tradition, but I just find the similarities to be intriguing, since they're by bands often discussed in this here Buh-log-uh. Theme: Man goes down to Mexico for some fun with the ladies. Finds it, but at a price. Main difference between the two..: ...is pretty much the main difference between the two bands. I.E., The Monkees had to keep it clean and under 3 minutes. The Dead could afford to add more detail and color to the story. And solos (although the studio version features a Mariachi band playing the riff). "What Am I Doin' Hangin' Round?" was written by Michael Martin Murphey and recorded by The Monkees for their fourth (and best?) album, Pisces Aquarius, Capricorn and Jones. Murphey was an old Texan friend of Michael Nesmith, and briefly had a band with Nesmith and John London called The Trinity River Boys. He moved from Texas to Los Angeles right around the time Nesmith did, with the same goal: make it in the music scene. He formed a band called The Lewis and Clarke Expedition, which had moderate success. But his biggest pay day came when Nesmith requested his old friend write a song for The Monkees. In any case, let's get to the story. Just a loud mouth Yankee I went down to Mexico. I didn't have much time to spend, about a week or so. There I lightly took advantage of a girl who loved me so. I should be on that train and gone. He's quite aware that things will get a bit sticky if he stays in Mexico too long. We don't need any broken hearts, or for an angry boyfriend to suddenly appear. We'll have to wait for the next song for that. So, best to split while the splittin's good. She took me to the garden just for a little walk. I didn't know much Spanish and there was no time for talk. Then she told me that she loved me not with words but with a kiss. Now we're back in our story, as he recounts his time with la Senorita. We see that the language barrier didn't make much of a difference since talking isn't what either of them had on their minds. Young ladies can be delusional, especially when making out with a groovy American rocker. And groovy American rockers think nothing of being cold and indifferent when it comes to breaking the hearts of strange girls who profess their love. So, he's all "thaaat's cute. well, hey, uh, I gotta split, um, that was fun. I'll call you." Well it's been a year or so, and I want to go back again. And if I get the money, well I'll ride the same old train. But I guess your chances come but once and boy I sure missed mine. Well, now we see that the Mexican girl indeed, in their brief time together, put a spell on our hero. So much so, that he wants to go back and find her. Language barrier or not. Possible jealous boyfriend or not. She has just not left his mind. Despite his resolve to go back, he also has one foot in reality, as he thinks that he missed his one chance with this love of his life. Will he be doomed to live a lonely life? Or take his heartbreak out on other unsuspecting girls as he takes them "for a little walk"? All we can assume is that on some nights he cries like that train whistle for the one that got away. 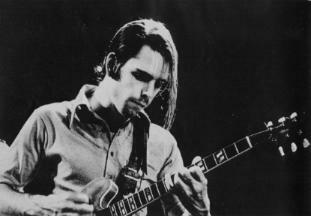 Bob Weir stood out in a band of misfits by appearing to be the one somewhat conventional guy in the band. He's handsome, looks like he actually looked in a mirror before going onstage (80's taste in clothes notwithstanding), and interacted with the audience while the others shoegazed/stared off into space/at each other. But conventional he is not (however much he may try). A dislexic prep-school drop out from wealthy step parents, he more or less learned to play on the job (he was 17 when the band started) and his guitar technique was shaped by playing with bandmates who paid little heed to rock and roll tradition. Thus, even the rock and roll or country songs that Weir loved to cover were filtered through the hazy and "inbred" (Weir's word for it) lense of The Grateful Dead as a band. From the start, Weir loved to cover country songs at the Dead's shows, and thus, until the band's demise in 1995, there was a 50% chance that the audience would be "treated" to a "Cowboy Bob Section" during the first set: "The Race is On", "El Paso", "Mama Tried", "Me and My Uncle", "Big River" or his own "Mexicali Blues" (music by Weir, lyrics by his trusty wordsman, John Perry Barlowe), sometimes played by themselves, sometimes in a medley. After, say, 1982, these parts of the show usually found the band on autopilot. Pretty hard to play convincing country when your guitars and keyboards are all running through MIDI processors. But otherwise, not much in the Weir canon to choose from (he and Barlowe weren't as prolific as Garcia and Hunter). If he really was courageous, The Dead would have covered "What Am I Doin' Hangin' Round" and probably would have gotten away with it. Pretty good set up, nice snapshot. But of course, "...shine my feet"?? Perhaps they kept that for comic effect. Or maybe Bob's bare hippie feet are so filthy that the boy thinks he's wearing shoes. I guess I came to keep from payin dues. And a damn good case of the mexicali blues. Whereas our hero in the Monkees song arrived from San Antonio, TX, in this song he's come from Bakersfield, CA (it's Mexicali, after all). Class, take note of the rhyming of "dues" and "blues". Now, this was made illegal in 1980, along with rhyming "blues" with "choose" and especially "shoes". There's no real penalty for it, however you can be sure that there's no reward either. And now let's get to the element of this song that gives this song its R rating. "..a bottle and a girl that's just 14". So he comes to Mexico, doesn't know why he's there, so decides to get drunk and find himself a young'n. Cause thinkin and drinkin are all I have today. Nice singalong chorus, goes to a comfortable place, musically. But lyrically, what's this "devil" he's singing about? Ain't no talk about no devil previously. Perhaps it's a sign of things to come. Oh, and class: "booze" and "lose" are pretty close to done too. As is "thinkin"/"drinkin". Remember, this was 1972. Only 1,500 songs had used these rhymes. Today it's up to 7,550. Please help the population growth. Some questions arise here. This 14 year old is named Billy Jean? Not very Mexican sounding. Fresh in town? From where? Is this a 14 year old runaway he's canoodling with? Perhaps he should be calling Social Services--not passing the time with her. In the second line: I always thought he said "state line"--like border. I don't know what a "stage line" is. But here we find that Billy Jean is the devil he speaks of. Really? A 14 year old runaway is the devil? You call yourself a man? I do like the "raven hair" description--pretty--although a few years later, Barlowe describes a woman as "raven dressed" (in "I Need a Miracle"). With a lifetimes worth of the mexicali blues. Contrast the first line here with the start of the second verse in "What Am I Doin..."
And then a man rode into town, some thought he was the law.Billy jean was waitin when he came. Id have no one but myself to blame. Ok, ok. We've seen this movie before. In fact, we've seen this in a Monkees episode before! There's one with a very similar script--A Nice Place to Visit--Davy falls in love with "Angelita" and her tough man "El Diablo" challenges him to a "dual of honor". My step son loves this episode. Here. Dig the first two minutes. It's funny. And now the violence. This is a turn that "What Am I Doin.." doesn't dare take. First off, there's no other man in The Monkees song, so there's no one to challenge to a duel. Catchy tune though! And you can two-step to it! In summer/fall of 1990, I finally got my first CD player, and first few CDs. I was 17, senior in high school, a bit tripped out, love sick and mad for drumming. I was fully ensconced in the alternative/college music of the day, and had been for over a year, after finally shedding my "all 1965-72" obsession. Thus, the music that appealed most to me was the stuff that did "that thing" to one's head; that thing that was ingrained in the best of the old stuff that I'd listened to. That thing that traveled the road from brain to soul and back again. And yet, made me feel that I was in the here and now. Two songs that I was obsessed with, and that still, to this day, can put me exactly in a certain time and place, were "Blown Away", by The Pixies (from Bossa Nova) and "Disappearer" by Sonic Youth (from Goo). I used to like listening to the two songs back to back and just get into a real deep place. This was without any external aid. Just the music. What is it about these two songs? Each have chord progressions that invite you to hop on board, like a cosmic skateboard flying by. The songs seem to both be waking from a dream.The melodies buzz and flicker like fireflies, singing words that tell vague, dream-like tales that are open to interpretation. The lead vocals both have a distance and reverb that suggest isolation--even disembodiment. They seem to be broadcasting from another plane. In any case, for a little while, I've been wanting to pay tribute to these two songs in a song or short story. I wanted to refer to them within a scene that somewhat captures a brief, magical time in my youth. This morning I thought about it again and decided a poem might do it best. After all, there's no real story to tell, in these songs or in my remembrance. It's just images, distorted memories. A mindset that, 21 years later, seems mummified and encased in glass. Dead but examinable. Thanks to Mr. Moore and Mr. Black for infiltrating my teenage mind with such magic. Who'd have thought I could now say I've played gigs with them? But that's beside the point. And kind of depressing. holding up pictures of lost loved ones. I know the hill you described. Are you like me? Do you wish you were playing music right now, but can't because you had a hernia operation a few days ago? I thought so. See? We're a lot alike. I knew that the minute I saw you. These fancy-free, pain-filled days of recuperating, I have no idea how I'll feel physically when I wake up, or what will strike my fancy to while away the hours. Today, my first thought was "I feel like reading an interview with Charlie Watts". One thing led to another and I discovered a site I never knew of before, which has a treasure trove (I've never used that term) of exclusive interviews. Jimi Hendrix (Jan 1967): ...it’s so embarrassing, man, when America is sending over the Monkees – oh, God, that kills me! I’m so embarrassed that America could be so stupid as to make somebody like that. They could have at least done it with a group that has something to offer. They got groups in the States starving to death trying to get breaks and then these fairies come up. Q: What do you think about the commercial pop scene right now? A: [Simulates a confused stutter] Well, have you heard the Marmalade and their record “I See the Rain”? I don’t understand why that wasn’t a hit. 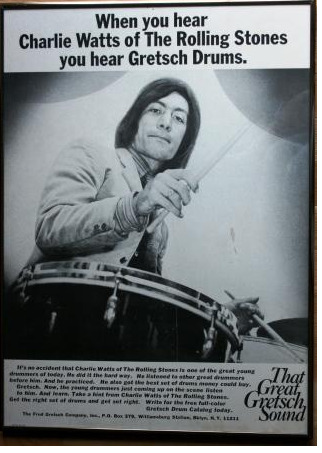 Charlie Watts (1994): Ginger Baker was a much better drummer than John Bonham, if you really want to know about drumming. Ginger Baker is the best drummer to emigrate out of England. I’ve got nothing but limitations! I mean, I’m limited by everything. I’m limited by my technique. I’m limited by my background. I’m limited by my education. I’m limited by the things I’ve heard. I’m limited by all that stuff. I’m limited by being a human being. Q: Are you satisfied with your accomplishments and your career? A: Not at all. No. No, no, no, no, no. 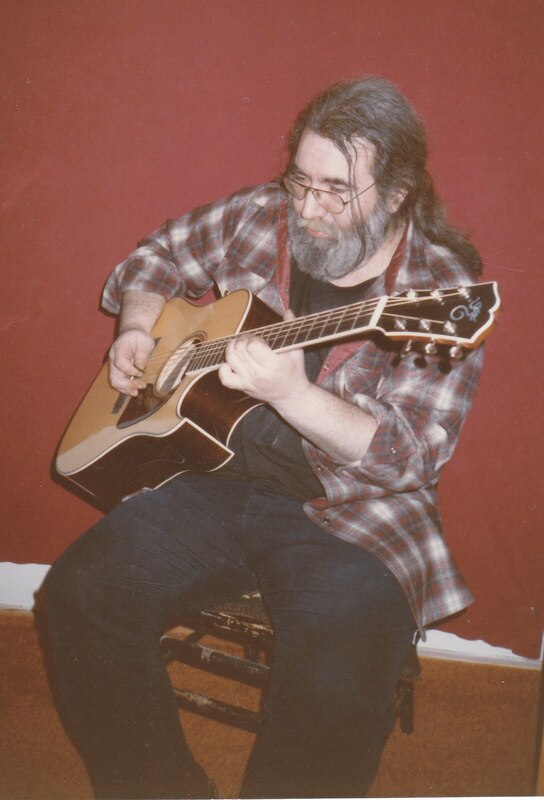 I still think of myself as someone trying to learn how to play the guitar. If I learn how to play the guitar, I’ll be really happy. Q: Why do you think you’ve attracted such a loyal following? A: ...I blame the general low quality of life, you know. The Garcia article may be the best (with him) I've ever read. Not only is he living in a friend's basement, and has cocaine dust on his tshirt (visible in the cover shot -! !-), but, unbeknownst to him, he's days away from 1) the band holding an intervention in that very house and 2) getting busted for freebasing in his BMW in Golden Gate Park. Nontheless, the interview is fascinating, with Jerry giving his views of everyone from Django to Dire Straits to Van Halen, his personal strengths and weaknesses (mostly the latter) and lots of guitar-dork talk that means little to me. Also, you see the charmingly self-loathing personality with the world on his shoulders that really is the perfect recipe for a bad substance abuse problem. Check it out. * The bunny quote is from the November 1967 interview with Jimi Hendrix. Awesome.